Afternoons tend to be quiet in the tree-shaded inner by-lanes of Colombo, with the stifling tropical heat bearing down on the city like an unwelcome blanket. Very little seems to stir in these languid hours until a faint tune, often a speedy version of Beethoven’s Fur Elise (or a similarly familiar number), draws closer. The tune is a clarion call to the neighbourhood that the bread van is on its midday rounds. As the shrill horn plays on loop for maximum impact, customers begin to trickle out onto the streets for their dalliance with their daily bread. Not so much a van as a glorified tuk tuk (as autos are commonly called in Sri Lanka), the bread van is a curiously commonplace convenience found across the country. A mobile bakery and a marketing tool rolled into one, the ‘paan’ van– paan means bread in Sinhalese – is instantly recognisable by its distinctive form. A modified tuk tuk with a glass display tacked onto its back, the bread van offers customers an instant glimpse into the attractive wares on offer. 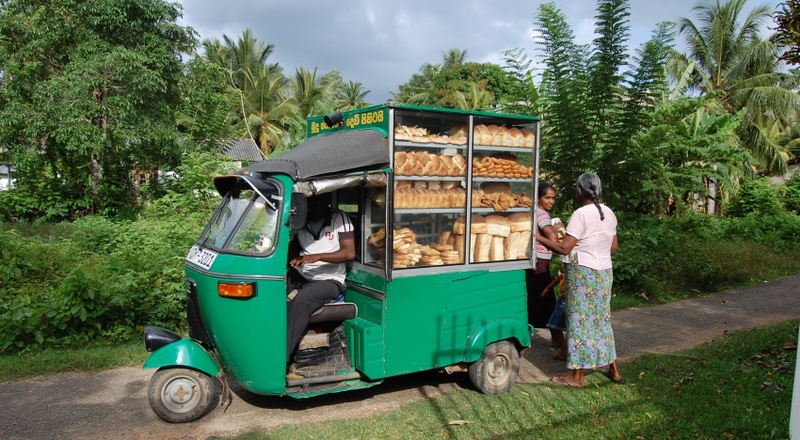 In my initial days in Sri Lanka, when I was still looking for a peg upon which to pin my tentative curiosity about the country, I would feel a frisson of excitement every time I came across a bread van. It seemed to hold the promise of a familiar and uncomplicated pleasure, especially for a carb fiend like me. A few weeks later, one lazy afternoon, a paan van made a detour from its regular route and stopped right outside our home. I darted outside to take a closer look at the goodies that I had been eyeing from afar for so long. Loaves of freshly baked, unsliced white bread occupied the highest row, while tea buns jostled for room with chocolate-glazed doughnuts on the second rung. I opted for a sweet bun, perfect for tea time, and slathered it with homemade peanut butter. Nearly two years later, I can still remember the flavour of that unfussy snack — it quelled, at least temporarily, the homesickness that had come in waves since I left India. Over time, I would come to be better acquainted with the unique mix of sweet and savoury snacks (or ‘short eats’, as they are endearingly called in Sri Lanka) that are regularly ferried around by paan vans. These include seeni sambol buns or slightly hollow buns that are stuffed with hot-sweet seeni sambol or caramelised onion relish; deep-fried cutlets with a golden-brown, breaded crust that are somewhat mysteriously called Chinese rolls; crisp, triangular cutlets with a peppery stuffing of potato and tuna, and sausage buns or de-glam hot dogs minus the trimmings. To satisfy the country’s abundantly sweet tooth, there are sponge cakes (not unlike mawa cakes, served in slightly greasy cupcake wrappers), and my favourite item, kimbula banis or ‘crocodile buns’, croissant-shaped buns that are lightly dusted with sugar crystals. Although it is a vehicle to deliver all manner of delights, the paan van’s most important cargo is also the simplest: bread. Unlike in India, where indigenous breads such as chapatis, parathas and puris form the central, starchy component of a meal, bread has come to be an accepted part of Sri Lankan cuisine. At breakfast, thick slices of kade paan (literally, store-bought bread) are paired with pol sambol or a chilli-smacked coconut sambol with a lemony punch, while at lunch or dinner, they could be used to mop up a fiery fish or crab curry. My husband says kade paan is the perfect stand-in for pav, but to me, nothing evokes the butter-soaked decadence of pav better than roast paan, slices of toasted white bread with a slick of butter or margarine on top. After having spent nearly two years in Colombo, like everything else that had once seemed so novel, the paan van is now a regular part of our lives. I can almost understand why many people in Colombo find the choon van (a colloquialism, most probably derived from the word ‘tune’) a minor inconvenience, piercing the quiet morning and afternoon hours with its tinny horn. Yet, there remains something endearingly unique about it, as I realised a few days ago. As I chatted with the driver of a van belonging to Ranvega Bakers, a suburban bakery with a large fleet of tuk tuks, something seemed to shake loose in our elite neighbourhood with forbidding, remote-controlled gates. A few neighbours appeared on their balconies to ask for their loaves of bread, while an elderly Burmese grandmother shuffled to the van with her grandson. She spoke no Sinhalese and little English, but it was the sort of transaction that didn’t demand any language skills. As she handed over the pastry to her satisfied grandson, it occurred to me that the love for bread is a shared language — and the bread van passes some of that love around.